Souvenirs from Around the World, originally uploaded by Stimpdawg. I got this idea from Andy’s My REAL Wall except I used souvenirs instead of postcards. 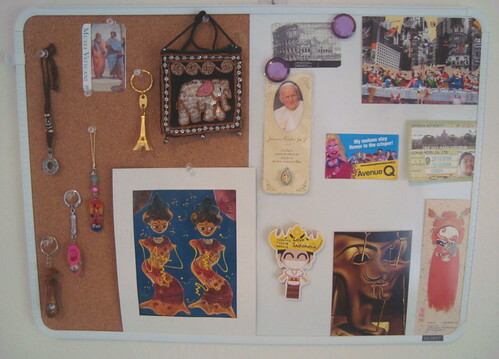 I took some of my souvenirs that I bought or saved during our trip around the world.. and placed them on my whiteboard/corkboard. Click the photo or here to view the Flickr page with notes for each souvenir. I used to buy a flag from each country I travel to (even though they’re likely not even made in that country). But I just… stopped after a while. I wish I could travel as much as you do! It is my dream to travel the world. I have only been around Canada and the United States but I too collect something from each place I visit. Right now it is key chains! I’m working on my own Wall of Travel myself. I managed to get to Chicago last summer as a start. Was also going to London this August until I lost my job. Well, I know where it is, but when I go there, there’s someone else at my desk. Melody: I’m glad you came to visit! I love reading your blog. It’s so inspirational. I can’t wait to find out about the project too! It can be very addicting reading great blogs and writing blogs. Vickie – That’s cool. How many flags do you have? I like buying souvenirs. I wish I bought more on the trip and mailed them home. Andrea: You should really go travel as much as possible. It’s awesome! Souvenirs are great to keep. K. Restoule – Hope you make it to London sometime. There’s so much to do there. I love the buildings! Wonderful idea! Souvenirs are great to keep, but after a while, they all end up in some box… You should write some memories on too! I recognize the souvenir at the bottom right corner. It is a facial makeup in Chinese operas, isn’t it?